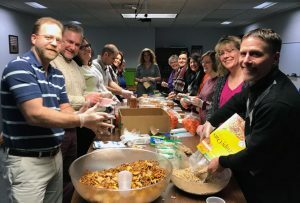 Since 2013, Marshfield Area United Way’s “Nutrition On Weekends” (NOW) program has been a collaborative, community effort to target childhood hunger. Currently serving 370 students, the program provides healthy, ready-to-eat nutritional foods for children during the weekend. Created in response to data collected from Marshfield students as part of the Youth Risk Behavior Survey, the program helps feed hungry students in the community. Marshfield Insurance is one of several local businesses that helps pack the meals for these students, ensuring they have enough to eat. According to Feeding American, kids living with food insecurity are more likely to repeat a grade in elementary School, experience development impairments in areas like language and motor skills, and have more social and behavioral problems. “Programs like the NOW program and access to food pantries assist families to meet the food needs of their children,” said Paula Jero, United Way Executive Director, adding that business support is essential to the program’s success. Marshfield Insurance commercial service agent Beth Langteau enjoys packing meals for local students in need. Langteau also enjoys joining together with her colleagues to help the community. Langeau added that she wishes all children could have the family-centered meals that she had growing up. A proud community supporter, Marshfield Insurance is happy to be one of the many businesses supporting the NOW program. We send information updates on the latest products and services. Copyright © 2019 TriMedia. All rights reserved.